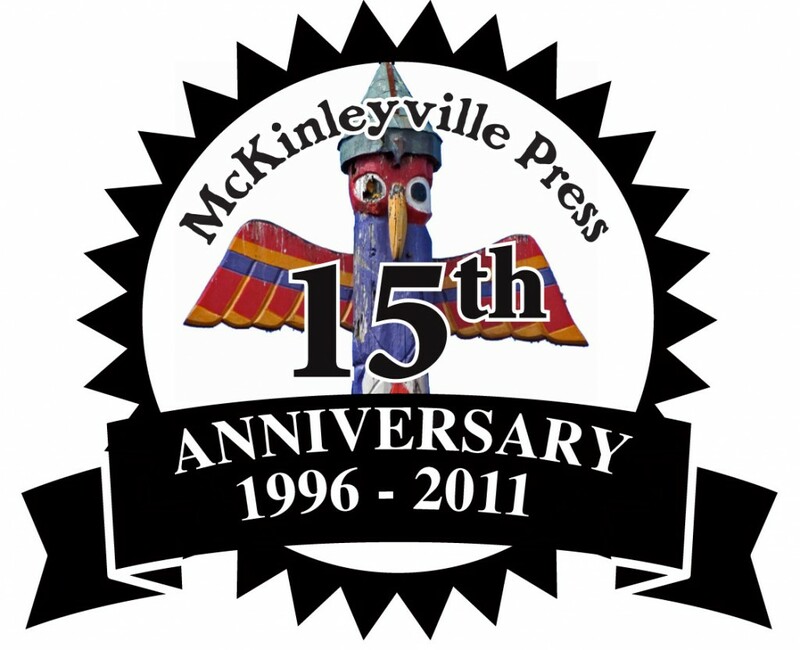 Note: In celebration of the 15th anniversary of the McKinleyville Press, Editor Jack Durham looks back on the newspaper’s history in a four-part series. Last week he wrote about the birth of the newspaper and the first edition hitting the streets. Here is the second installment. – Ed. After the first issue of the McKinleyville Press came out, subscription checks trickled in. We had a dozen subscribers, then two dozen, then three dozen. To save money, we hand delivered the newspapers to each subscriber. We drove all over town stuffing newspapers in mailboxes, tucking them under doormats or handing them directly to our readers. I had a lot of fun doing this. I got to know our readers on a personal level. I received feedback from them, and sometimes story tips. But as the subscription list grew, this delivery method became unmanageable. It was time to get acquainted with the U.S. Postal Service and the beauty of Second Class Postage. After the first edition, more columnists joined the paper, including Kate Ramey, Thelma Hufford, Elizabeth Alves and Patti Fleschner. The paper’s slogan was “Your Town, Your Newspaper.” The focus then, as it is now, was on local news. There was no shortage of fodder for the news. The McKinleyville Citizens Advisory Committee was battling over the McKinleyville Community Plan – a process which continued for another four years. The McKinleyville Community Services District had its own political battles along with a variety of projects underway, including a new library and ballfields. The town was booming, and there was always something to write about. Commercial buildings were going up around town. New businesses were opening. People were growing dope and getting busted. It seemed like almost every issue had a “scoop,” which was fairly easy since no other papers were really covering McKinleyville with much depth. In some ways, life back then for me resembled the movie Groundhog Day, in which a weatherman is doomed to relive the same day over and over again. Except in my case, instead of a day, it was a weekly cycle. It was exhausting, but it was also fun and, at times, exhilarating. Back then, the paper was printed Monday morning. After having stayed up half the night putting it together, I’d drive to Smith River, then drive back to the house. We put inserts in the paper by hand, and stuck mailing labels on all the subscriber copies. By late afternoon, the papers were hopefully delivered on time to the Arcata Post Office. That evening I could rest until the next day, when it was time to deliver the papers to newspaper racks and retail locations. Then it was time to return phone calls, contact advertisers and work on articles and photos for the following week. I covered meetings, which sometimes went on until 11:30 p.m. That made for a long workday. I sold ads, made ads, wrote articles and took photos. Preparations for the coming deadline began on Friday night. Columns needed to be typeset and articles written. On Saturday, pages were cleaned and set up. On Saturday night, when it got dark enough, it was time to develop film, make prints and scan them in. On Sunday, it was time to assemble pages and write any last-minute articles. If all went well, pages were corrected on the computer by 10 or 11 p.m. on Sunday. Then, they were tiled out on 8.5-by-11 inch sheets of paper, cut up, waxed and assembled. By 2 a.m. or 3 a.m., the pages were done, and I could catch a little sleep before heading back to the printer in Smith River. The process continued week after week. Some weeks I would work 70 hours, or more. Despite the long hours, I had fun, especially when I was a reporter. A reporter is, hands down, the best job to have at a newspaper. There’s nothing better than digging up a story, finding out all the details, and then scooping the competition. Nine weeks after the McKinleyville Press was born, my former Union coworker, Kevin Hoover, created the Arcata Eye. As odd as it sounds, I think Kevin and I were still grieving over the death of the Union, a paper we deeply admired and missed. By creating new papers in its place, there was a feeling that we were resurrecting the Union, but in the form of two separate newspapers. That was deeply satisfying. We decided to create an informal alliance with a grand name – the Mad River Newspaper Guild. What is the Guild? Nothing, really. It’s just verbal agreement between two newspapers that they’ll help each other out every once in awhile. For instance, years ago I was on deadline and my printer broke. I called up Kevin and he loaned me his printer and saved the day. Sometimes we share stories. Sometimes we share photos. We use a photo of the Hammond Bridge – the link between McKinleyville and the Arcata Bottom – as the Mad River Newspaper Guild logo, which appears at the bottom of page 2. Although the Press and the Eye compete for a limited number of advertising dollars, it’s been a blessing having a sister paper of sorts. I’ve been able to watch Kevin experiment with all sorts of ideas, both on the editorial side and with his business model. I’ve watched what worked and what didn’t work – and took note. One of the biggest lessons I learned was that a community newspaper should only be as big as what the community will support. Sounds simple now, but it was a lesson that took more than a decade to learn. For years I was always trying to print more pages. Ten pages were fine, but 12 were better. If I could fill 14 pages, I’d do it. Sure, it was more expensive and time consuming, but it was an investment. Readership would soar, and advertising would blossom. But the only thing that soared was personal credit card debt. Years later, I figured this out and came to the conclusion that small is beautiful. Until that happened, however, bigger was better. I wanted to grow, grow, grow. In 1998, the McKinleyville Press got an office upstairs at 1660 Central Ave. The paper was getting bigger, and I wanted a place where I could meet with clients and maintain an archive of newspapers. It was also a place where the paper’s first real employee – Jessie Faulkner – could work. At least that was the plan. So we set up the office. I scoured thrift stores for office furniture. Tim Hooven of Hooven & Co. donated a full-sized desk and had a crew carry it upstairs. The desk was in good condition with only one problem – it had a broken drawer. No problem, I thought, I can fix that. All these years later I’m still using the desk, and the drawer is still broken. It turned out that we didn’t use the office very much. Jessie was able to do most of her writing from the comfort of her home. She could submit her articles on disks, then later via email. With late deadlines, it was more comfortable to work from home. So the office was only occupied a few hours a week. That didn’t change until a few years ago, when the office became the location where the paper was actually produced. With Jessie on board, we had more and more content. The paper got bigger. We now had in-depth coverage of both McKinleyville and Trinidad. A few years later, Daniel Mintz rolled into town and offered to cover the Board of Supervisors and county-related issues. We had even more content, and more depth. With a couple years under our belt, people seemed to take the paper more seriously. We were here to stay, at least we hoped so. Next week: The worst selling edition of all time, hyper-local coverage, a relationship implosion, paper up for sale. Jack Durham is editor and publisher of the McKinleyville Press. This entry was posted on Friday, August 5th, 2011 at 8:17 am	and is filed under Opinion, Business, Media. You can follow any responses to this entry through the RSS 2.0 feed.